Veterans Day is this nation’s opportunity to remember those who have courageously served on the front lines and made profound sacrifices to insure the freedoms we continue to enjoy. Because of these sacrifices, it is the nation’s duty to honor these heroic men and women by insuring that those who gave so much return home to a grateful nation committed to their well-being, including seeking information about whether the psychiatric drug “treatments” prescribed under the guise of “care” may be causing more harm than help, and may be responsible for the epidemic of veterans suicides. Both Houses of Congress have taken much needed steps. Recently submitted legislation by Congressman David Jolly (R-FL), the Veteran Suicide Prevention Act (H.R. 4640), will go a long way toward upholding the nation’s contract with its returning heroes. The legislation, which would investigate the long overdue connection between psychiatric drugs and Veteran Suicides, Senator John McCain (R-AZ) has introduced companion legislation in the Senate, the Veterans Overmedication Prevention Act, which directs the Department of Veteran Affairs to conduct an independent study regarding the relationship between veteran suicides and the psychiatric drugs prescribed them. For years, Citizens Commission on Human Rights (CCHR), a mental health industry watchdog, has called on lawmakers to take an in-depth look into the connection between psychiatric drugs and suicidal behavior of our military given that the drugs carry dozens of international drug regulatory agency warnings citing suicidal ideation as a side effect. Veterans are killing themselves at a rate of twenty per day—one every 71 minutes. As of 2010, 1.85 million veterans filled at least one psychiatric drug prescription and many are provided “cocktails” of psychiatric drugs. Approximately 37% of recent war veterans have been diagnosed with Post Traumatic Stress Disorder (PTSD) and 80 percent of those are prescribed a psychiatric drug. Of the veterans receiving psychiatric drugs for PTSD, 89% are prescribed antidepressants and 34% are prescribed antipsychotics. Those two classes of drugs alone, antidepressants and antipsychotics, carry 254 international drug regulatory agency warnings, including 38 warnings of suicide, 21 on mania, psychosis and aggression, and 25 on causing death. Approximately 37% of recent war veterans have been diagnosed with Post Traumatic Stress Disorder (PTSD) and 80 percent of those are prescribed a psychiatric drug. 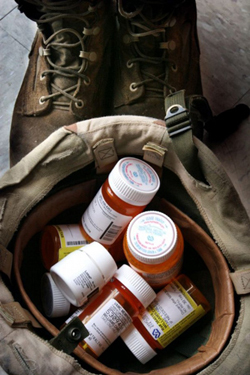 Further, there are numerous examples of veterans prescribed psychiatric drugs documented to cause hostility and violence, who then committed deadly acts under the influence of such drugs. Ft. Hood shooter, Ivan Lopez, for example, was receiving mental health services and taking Ambien, antidepressants and other drugs to treat anxiety and depression when he killed three and wounded 16. Washington Navy Yard shooter, Aaron Alexis was taking the antidepressant Trazodone when he killed twelve and wounded eight, and Bradley Stone, who killed six family members before killing himself, had been receiving mental health services and had the antidepressant Trazodone and the antipsychotic risperidone in his system at the time of his death. CCHR honors those who have selflessly given of themselves to insure the nation’s freedoms and believe, for too long, too many of the nation’s best have been needlessly dying and CCHR applauds the efforts by Rep. Jolly and Sen. McCain for taking up their cause.